There is no doubt that Greek culture was greatly influenced by others, especially those from the East and while it is necessary to remember this eastern influence, ancient Greece did develop its own unique culture. After the Battle of Corinth in 146 BC, Greece was finally brought under the control of Rome and despite being defeated, ‘Greece, the captive, made her savage victor captive, and brought the arts into rustic Latium’ (Horace, line 156-7 above). The Romans deeply admired the culture of the Greeks and thought it worth emulating. Greek intellectuals came to live in Rome and many children from elite Roman families had Greek tutors. Indeed, ‘by 133 [BC] probably most educated Romans were bilingual’ (Scullard). Horace (65-8 BC), himself a Roman, was educated in Athens. 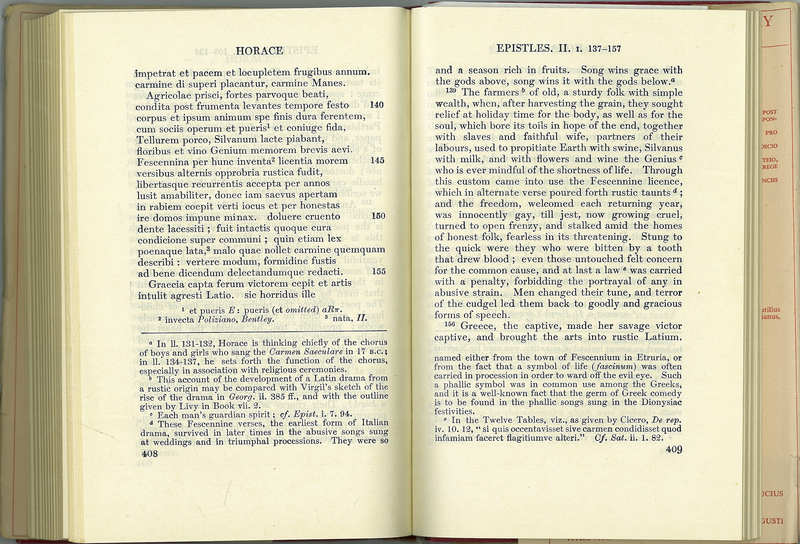 Horace, “Satires, Epistles and Ars Poetica,” ourheritage.ac.nz | OUR Heritage, accessed April 22, 2019, http://otago.ourheritage.ac.nz/items/show/7857.